I know I will get emails if I don't answer this question here. 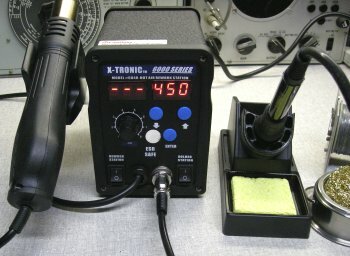 What soldering equipment do I use on my workbench? 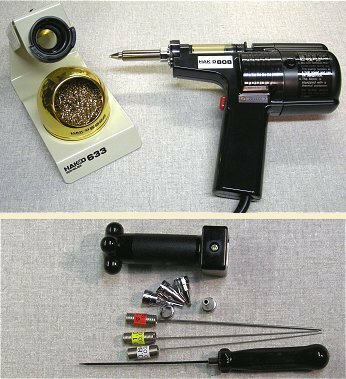 For working on vintage equipment, assembling or repairing through hole circuit boards, etc..
Weller WTCPN Soldering Station, Vintage Circuit Board Holder, various hand tools, and an Edsyn FXF11 Fume Extractor. I have used this Weller station for 30+ years. It's been through hell and back and works as good as the day I bought it (used!). I've replaced the connector, a few tips, and sponges over the years but this Weller station still gets daily use and does not let me down. Although I work on mostly vintage electronics, surface mounted components are becoming more popular so I have added a hot air rework station station (below). 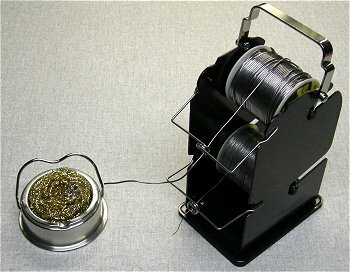 I cobbled together a solder holder that's tall enough to hold a 1 pound roll of solder and a roll of solder wick (for de-soldering). 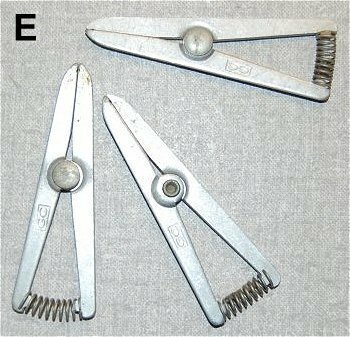 The alligator clip on top comes in handy for holding a wire steady or as a simple heat-sink. 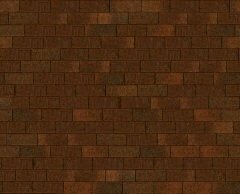 I have a few of these and keep one in each shop. It's dual heat and size makes it great for heavy duty electrical work when I need more heat than my soldering station will generate. I also use one with a cutting tip for cutting nylon rope. It makes clean cuts and melts the strands together to prevent fraying. 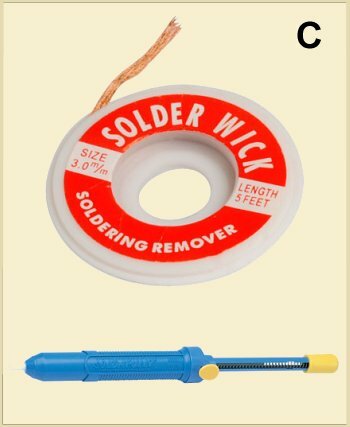 A Solder-Sucker and a roll of copper braided solder-wick come in handy for removing excess solder left by me or others, or removing solder from component leads and circuit boards. If you have the funds, a desoldering gun makes desoldering components from a circuit board easy. Check out the Hakko 808 desoldering gun below. 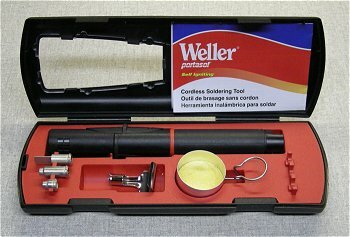 This 40 watt Weller is perfect for use in my portable tool cases. Heats up in a minute or so and I use a short piece of ½" copper pipe to slide over the shaft and tip so it can safely be put back in the tool case right after use. These heat sinks clip on sensitive components like transistors . 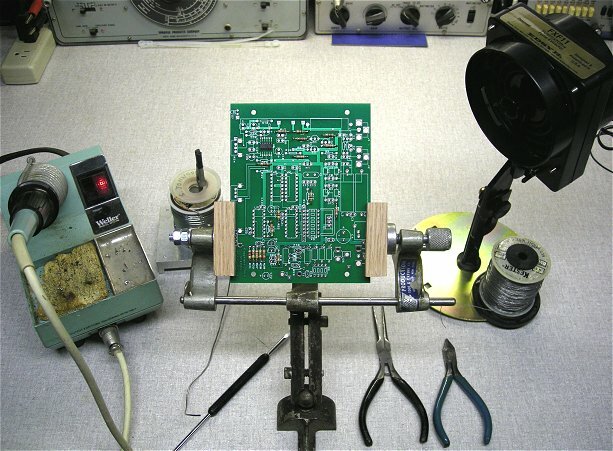 They are placed on the lead between the component being soldered and the soldering point to help prevent overheating and destroying the component when it's soldered or unsoldered from a circuit board. 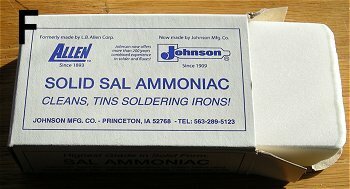 Solid Sal-Ammoniac is used for re-tinning soldering tips. Using one of these blocks may help re-tin an iron tip that's in poor condition and prolong the tips life. 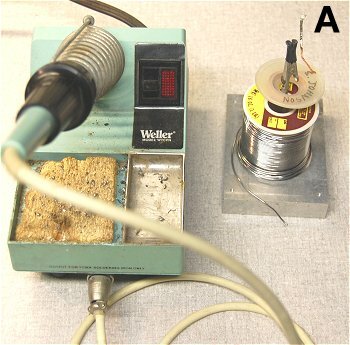 Caution must be used to make sure no residue remains on the tip as Sal-Ammoniac may corrode some electronic component leads and circuit board runs. I use it as a last resort. 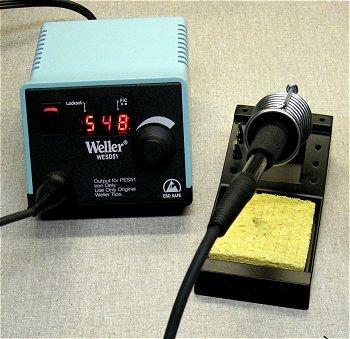 For soldering work where I need to vary the tip temperature I use this Weller controlled temperature soldering station. I prefer to have a single knob to control the temperature. Buttons can be a pain if you need to change temperatures often. 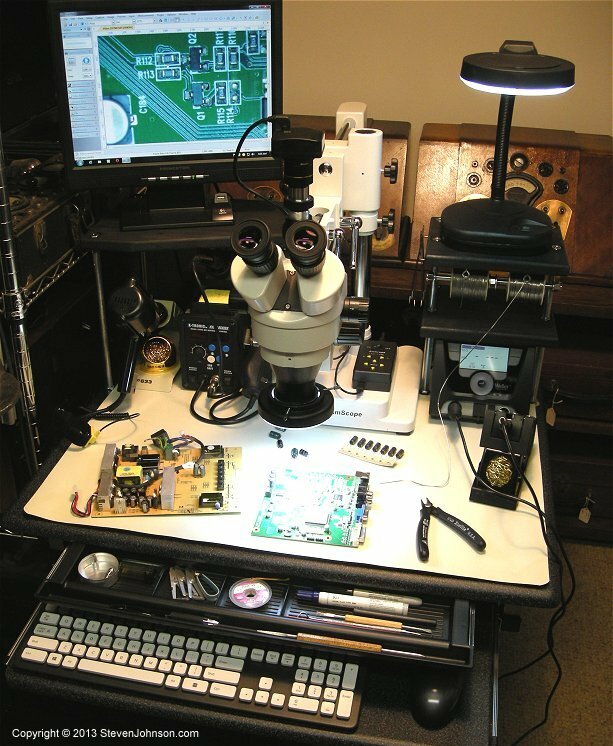 This ESD (ElectroStatic Discharge) safe soldering station I put together includes an inspection microscope with a USB camera for working on small surface mount devices (SMD) and ESD safe soldering, desoldering, and hot air tools. 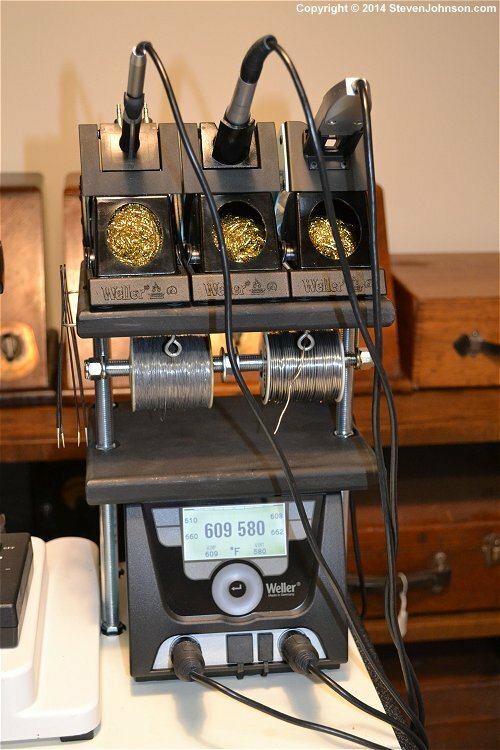 I use this Weller WX2 soldering station for working with surface mount devices. It's programmable using it's touch screen or USB port. 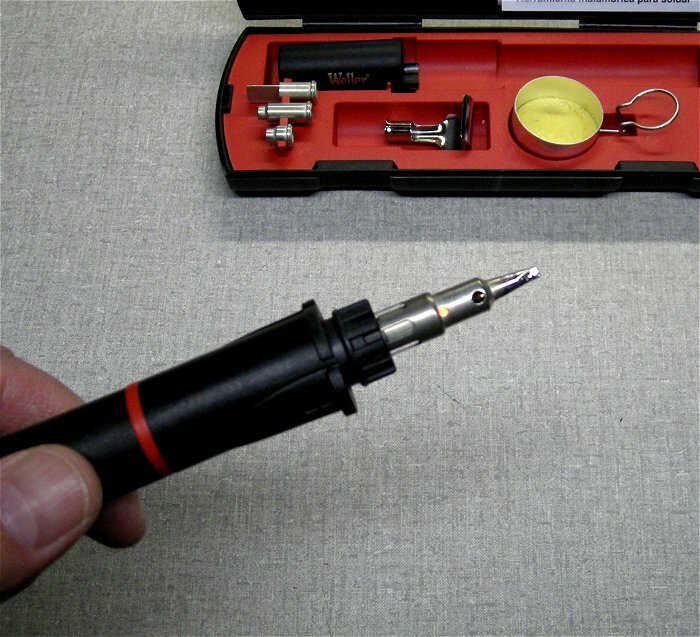 The WXMP pencil soldering iron has a small enough tip for detailed work and the controller also has plenty of power for an iron (up to 200 watts) and a pair of SMD tweezers for surface mount devices. This X-Tronic model 6040 Rework Station is for removing and installing newer surface mounted devices and integrated circuits. It combines a hot air gun and a 60 watt soldering iron in one unit with digital heat controls and a separate display for temperatures of each. Airflow for the hot air gun is controlled by a knob. 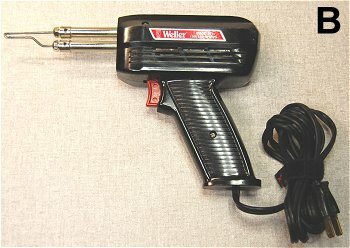 The hot air gun's heater shuts off automatically when it's set back in the cradle and the blower in the gun runs until it's cooled down. Not sure how I ever got along without this for thru-hole circuit board work. Place the tip over the component lead and pull the trigger. The component will fall out of the board. It does not plug up and the chamber on top and is easy to empty. Get a couple different size tips and cleaning tools with it. The optional holder is handy but not necessary as the gun will lay flat on the bench. The kit comes with spare filters and a 1 mm tip (most popular size) but it works best if you have a good fitting tip. I also purchased .8, 1.6, and 2.3mm tips along with the cleaning tool for each size. If you have a board with components on both sides I recommend you get the long 1 mm tip also (my favorite). The Aoyue brass wool tip cleaner (left) is a great way to keep your tips clean. This one has a nice metal base with a handle that can double as a iron holder. It's better better for the tip than a wet sponge. It won't cause the plating on the tip to crack reducing tip life. 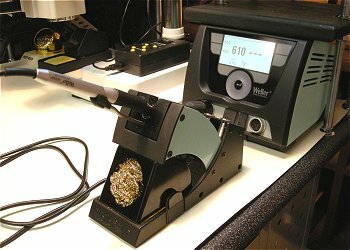 Hakko model 611-2 Dual Solder holder (right) - I never thought I'd use one of these but it comes in handy when I'm using two different solder gauges for a project. I keep the larger gauge roll that I use the most on top so when the bench gets crowded I can easily grab it. I love this thing. Self ignites and heats up in a couple of seconds. Has a nice case with an assortment of tips and fits perfect in the bottom of my tool kit.